Introduced for general issue in 2001, the Vegetato Woodland camouflage (also known as 'mimetico Vegetata') is a current camo pattern of the Italian Army (Esercito) and Carabinieri. It is a 4-colour mottled pattern, consisting of various jagged edged blotches, in sand, russet, chocolate brown and olive green, all on a khaki base. Such set of colours results this characteristic camo pattern works perfectly in Mediterranean environments, especially arid grassland with some wood, scrub and bush. It is also ideal wherever standard greens and blacks of patterns are too dark and stand out too strongly. Some also treat Vegetato Woodland camo as a kind of all terrain pattern as its colour profile is dark and brown enough to works in the central European woodlands. 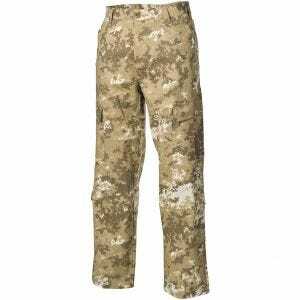 For all its customers, Airsoft, Hunting and Paintball enthusiasts, the Military 1st offers broad and growing range of clothing, equipment and accessories in this characteristic camouflage, including selection of quality combat shirts and cargo trousers.